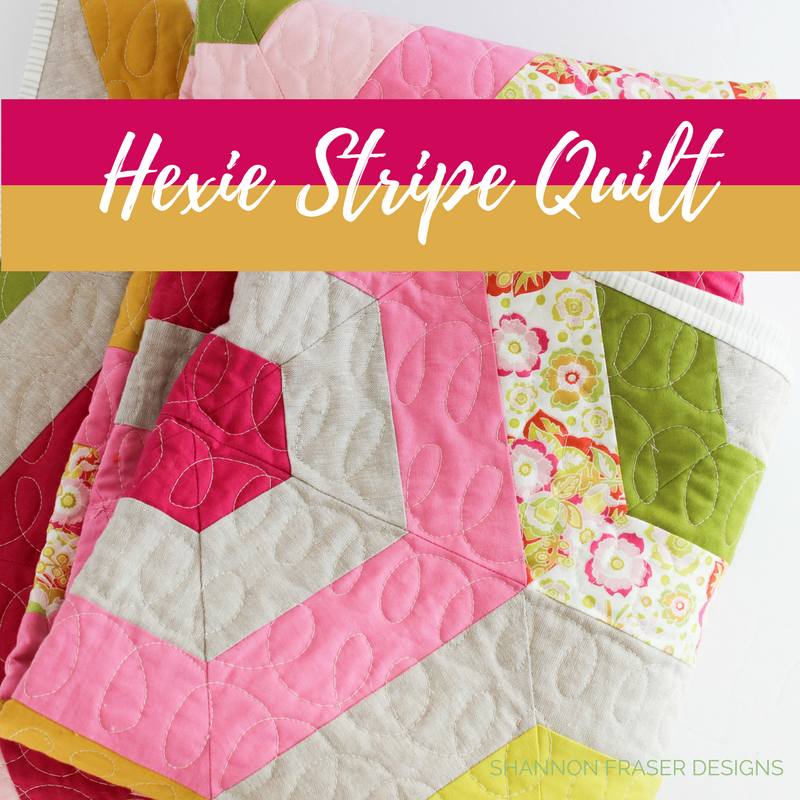 This project all started back in the early spring when Suzy of Suzy Quilts reached out to me to say she would love to see my interpretation of her Hexie Stripe quilt pattern. 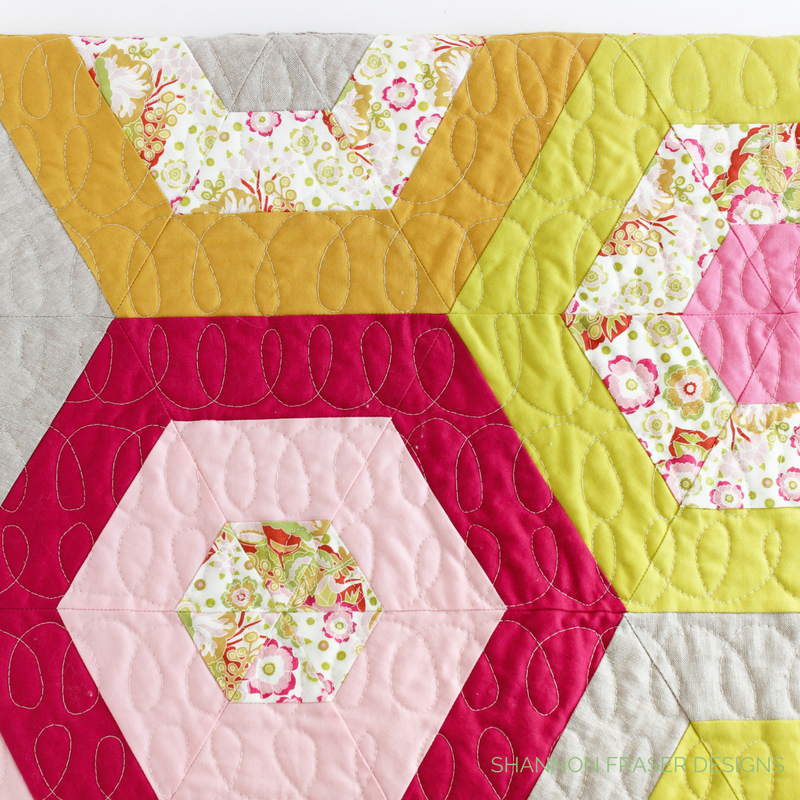 Suzy is just the sweetest and, although life was crazy at that time, I just couldn’t say no 😉 Besides, her quilt patterns always pack a visual punch, and the Hexie Stripe quilt pattern is no exception. With the A-OK from Suzy, I got to work. I wanted to go with a bold floral and this Anna Maria Horner Folk Song Baby Bouquet Sweet print had been sitting in my stash just waiting for the perfect project to come out and play. This was THE one! Since I wanted the focus to be on the floral, I then searched for a mix of solids varying in tone from light to dark. 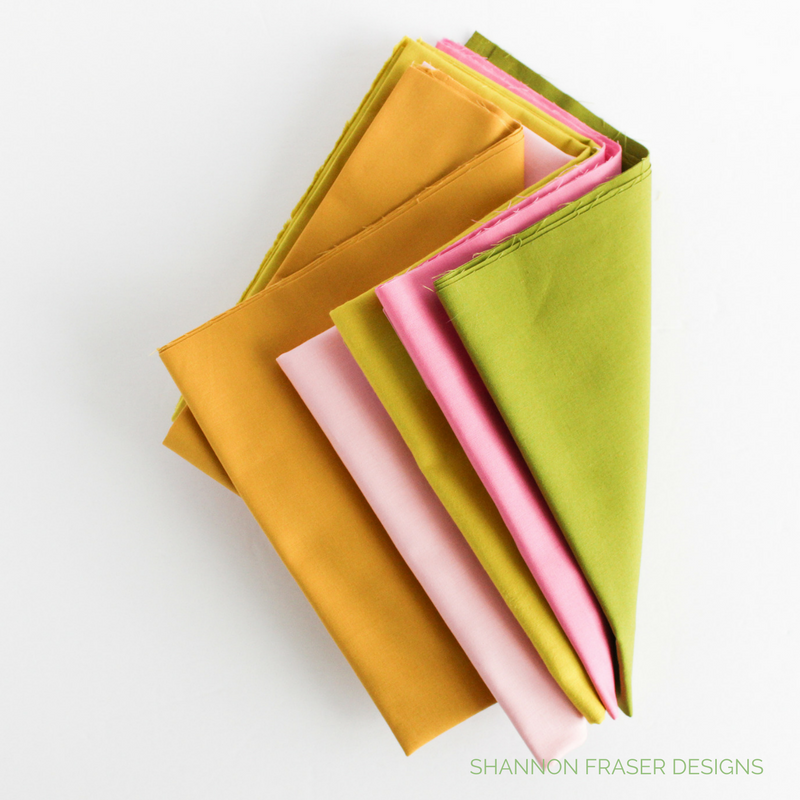 You know my love for pink, so naturally, that found it’s way into my colourway – specifically in the form of Kona Cotton Solids in Peony, Candy Pink and Valentine. 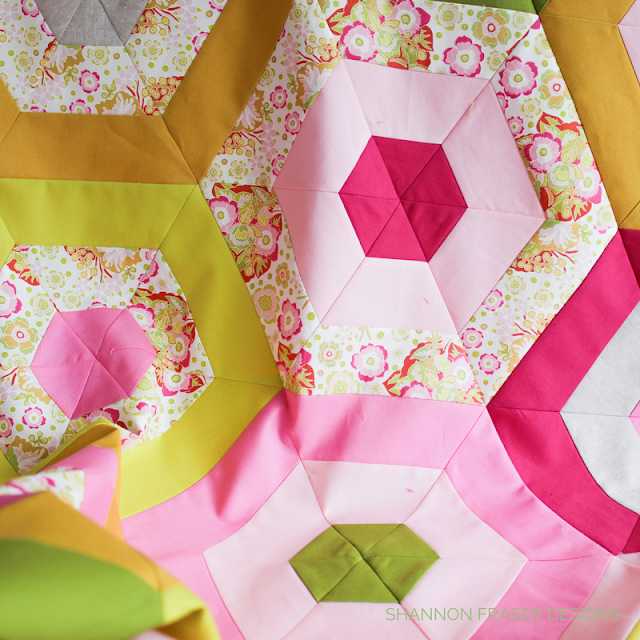 I didn’t want this quilt to be too pink, so I pulled in a little Wasabi. I then added some texture with the Essex Linen in Flax. When I did my pull I even knew that I would be using this organic stripe print for the binding from Camelot Fabrics. Love when that happens! This quilt comes together super quick and is really fun to make. 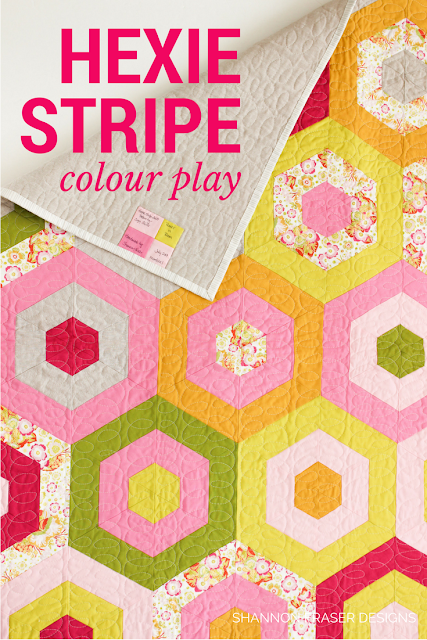 I love how the colours play off one another and seeing those hexie pie slices was just too cute and totally inspiring. You will have so much fun playing with layout!! 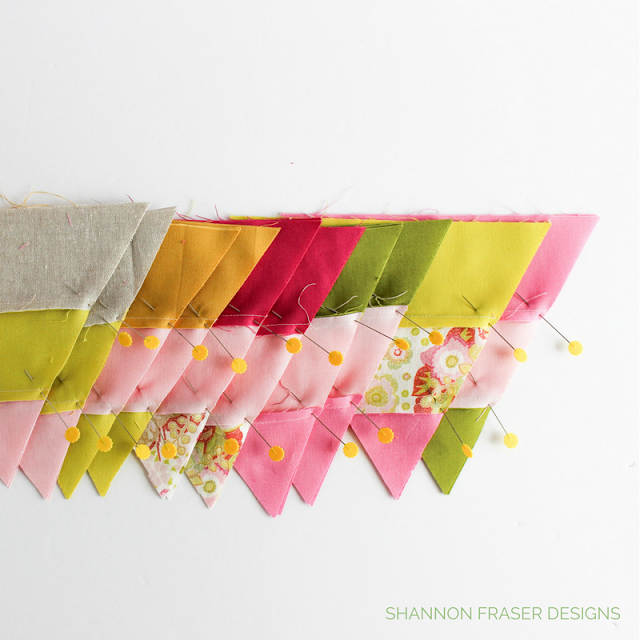 Once I had enough hexies made to pull together a table runner, I was looking at how it was all coming together and I was in LOVE. Love, I tell you. That I decided to abandon my table runner plans and go for the Full Monty. Only problem was that I didn’t have enough of the Anna Maria Horner print to make a larger quilt. While waiting for my fabric to arrive, I spent countless hours staring at my design wall trying to decide on the layout. That’s normal, right?! 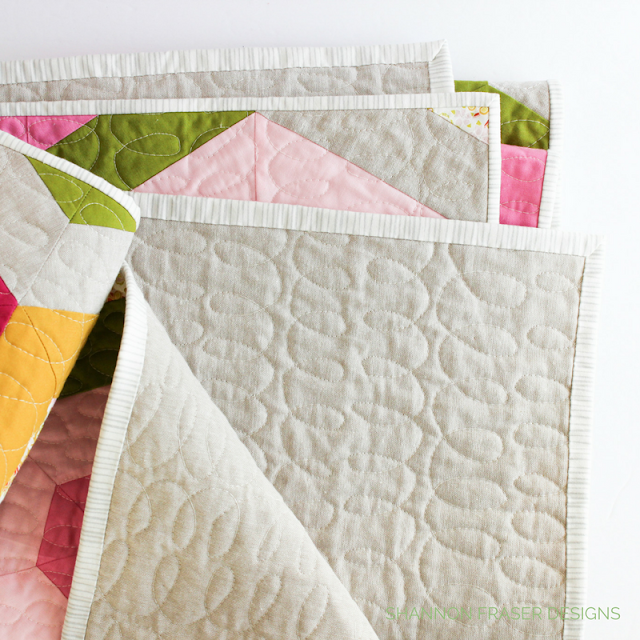 All quilters spend a ridiculous amount of time on block placement?!! The hubz walked past me one night while I was in one of these modes and was wondering what I was doing…just standing there starring. 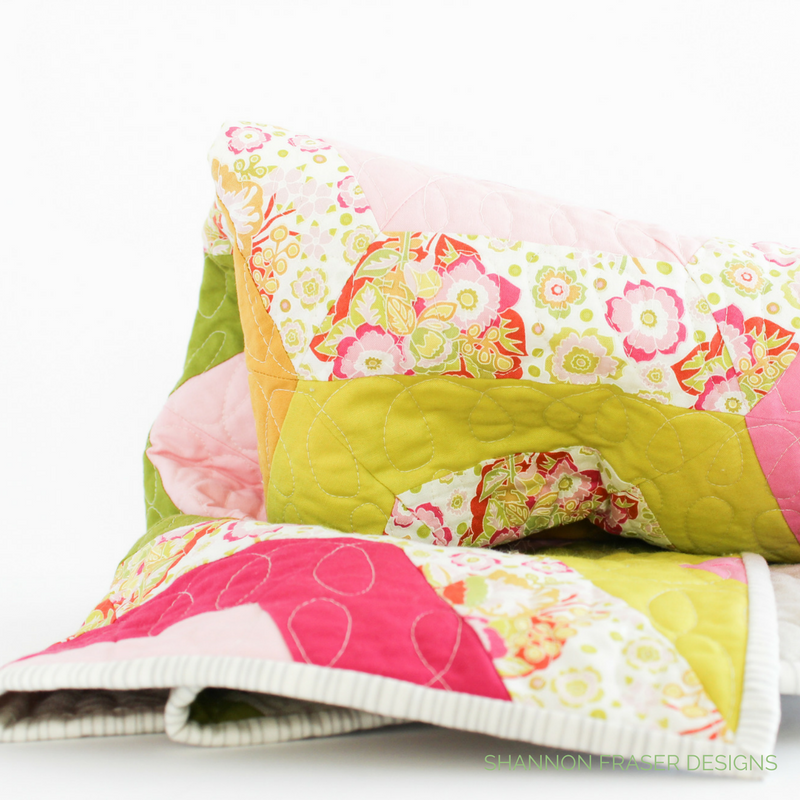 Ah, the life of a quilter! There was lots of pinning in this one. I’m not usually a pinning kind of girl. But working on the bias is always a little tricky with all that stretch. Pinning becomes your quilty friend, especially when you have so many points to match up! Suzy rocks her patterns and always includes lots of tips, tricks and tutorials to help you on your way to quilt success. You can get your own copy here. On a side note, how cute is this dog ear confetti?! Honestly, I have a problem. I’m always so smitten with the scraps and trimmings of my projects that I can’t resist playing with them. 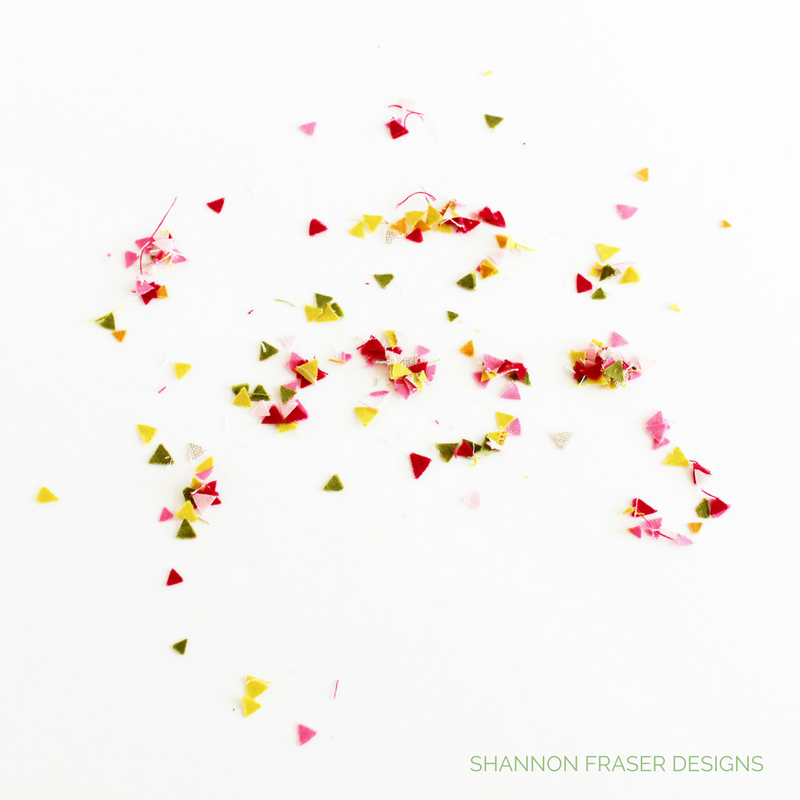 I mean, come on, wouldn’t you want a party with lots of dog ear confetti?!! I digress, back to this pretty quilt. Once she was all pieced together, next came the tough decision on how to back her. I hummed and hawed at this stage for quite awhile before deciding on the Essex Linen in Flax. I wanted something that was soft and soothing and that wouldn’t compete for attention with the beautiful front. 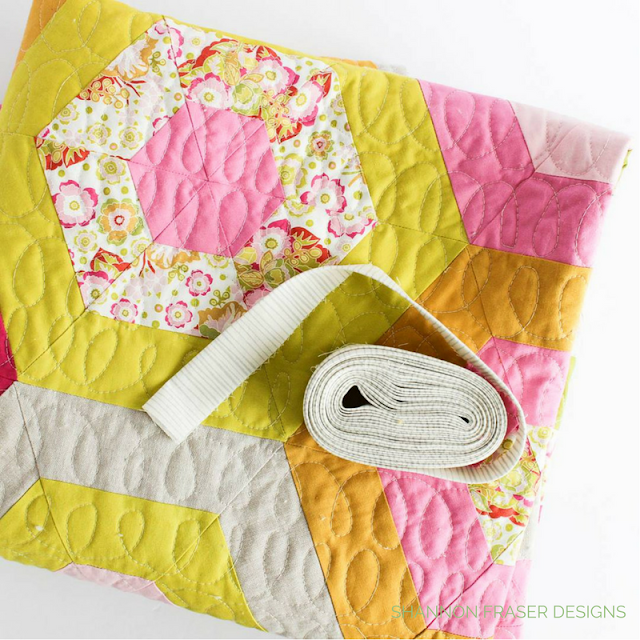 Plus, the Essex Linen adds wonderful weight and texture to the overall feel of the quilt, which is perfect for all those quilty snuggles! With the backing pieced, next question was how to quilt her up. I have been meaning to give free motion quilting (FMQ) a go for quite some time now. Although there have been lots of test patches and trial runs done, the thought of doing FMQ on an actual quilt was terrifying to me! 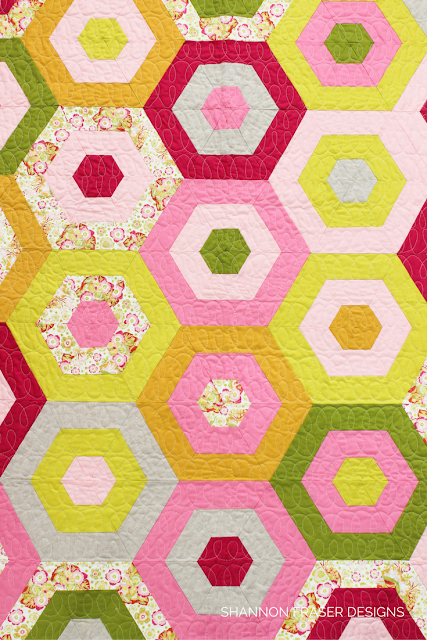 Testing is one thing, but a full-on quilt is a whole other ballgame. I just had this feeling that I was going to ruin my quilt top!! You know what I’m talking about. 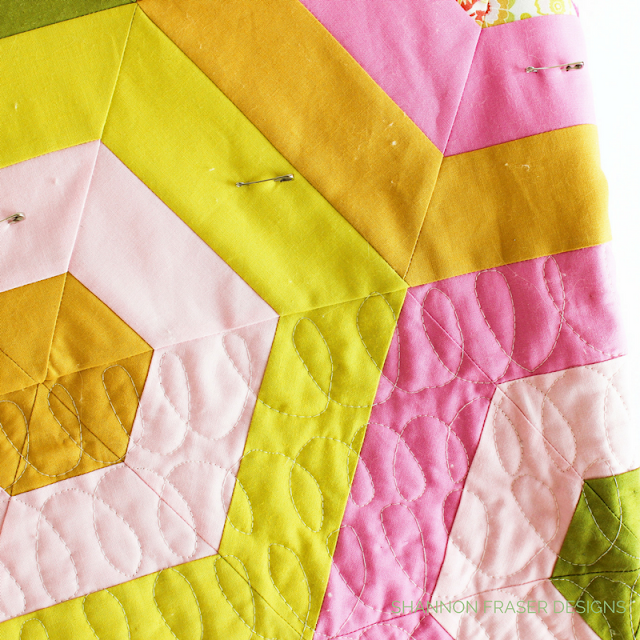 The first time you try quilting anything is less than stellar. But, in order to get better, I knew that I needed to take the plunge. And this beauty is what finally drew me to give it a go. And I was especially thankful for all the encouragement I received on Instagram when I was about to tackle it all. A special thank you to Anne Boundy who told me to “put my big girl pants on” and just do it! LOL – I loved that little note. So true! And, boy, am I ever happy I did! I was a little concerned when I first started as my loops were anything but consistent, but as I progressed and got more comfortable with the feeling, speed and technique, I started to LOVE FMQing. It was relaxing. It was methodical. It was bliss. Really! I especially love all the quilty texture FMQ gives to the final quilt. The Aurifil Cotton Mako 40wt thread I used in Silver White #2309 blends perfectly. The feel of this one is AMAZING. 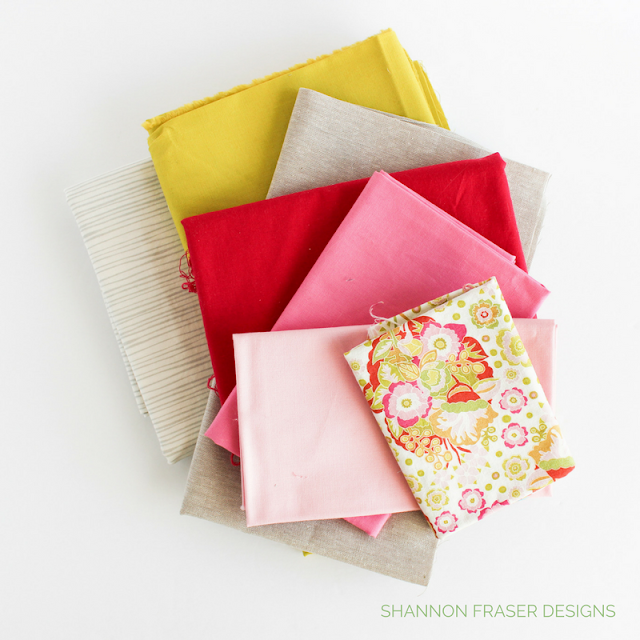 Not only do I have all that quilty goodness, but the fabrics add a whole other sensory level. And the Essex Linen backing adds gorgeous weight to the quilt. The snuggles are going to be sooo good! Bulky seams – now I understand what everyone is talking about! With straight line quilting bulky seams can be a nuisance but with my Juki I generally just sail right over them. This wasn’t the case with FMQ. Perhaps because I am still getting the hang of it, meeting with up those bulky seams often meant a little squiggle in my FMQ design. I met much more resistance than I’ve traditionally encountered up till now. So much to think about – there are so many details to keep in mind when FMQing – speed, movement, tension, posture…ugh, posture! I kept having to remind myself to relax my arms and shoulders. It was a tip I’ve heard Angela Walters share in her YouTube videos and it kept coming to mind while stitching away. And it totally works. The more I relaxed the better my designs came out. Plus, I can only imagine how much more pain I would have been in had I not been actively trying to relax! Consistency – Keeping a consistent speed with the petal and your hands is not the easiest thing! This, I’m sure, comes with practice. It was fun! Really, it was! I was surprised at how enjoyable doing my little loop de loops was. Once I got into a groove it was so nice to catch up on some of my fave podcasts. The binding stage was a no brainer as I had already prepped her during my cutting sessions. So, after a quick squaring up of the quilt, the first stage of binding was on. You know I’m not the fastest hand sewer, so, things took some time at this stage. Plus, I had quite a few other projects on the go and some had tight deadlines to hit. But this little pretty was never far from my mind…or sight, as she was patiently draped over the back of my sofa for many months just waiting to be finished. With the binding done, and label on (make your own DIY quilt label with tips here) the next challenge was getting her photographed! It took me three different photo sessions before I got a picture that truly reflected the colours. The lighting in the first couple of shoots was either too strong or too dim, but the third worked out perfectly. And, with all these delays, Fall had arrived, and I just love how the fall leaves coordinate quite nicely with…you guessed it, Curry!! 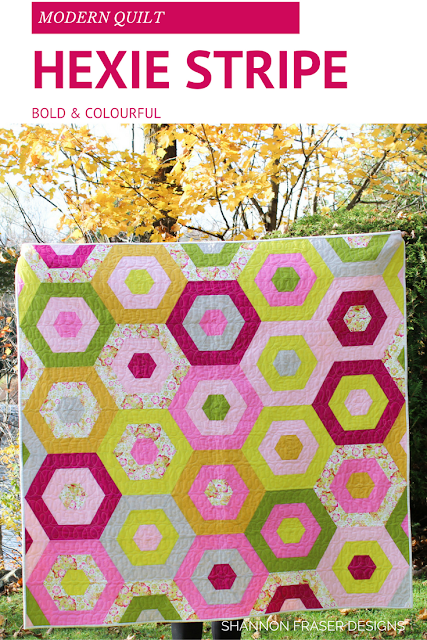 Although this is a really bright quilt, I love how it melds with the autumn colours. And this is one of the projects off my Q4Finish-A-Long list. I’ll update it once the link opens up. Put your big girl pants on! I need to embroider that and keep it as a constant reminder. 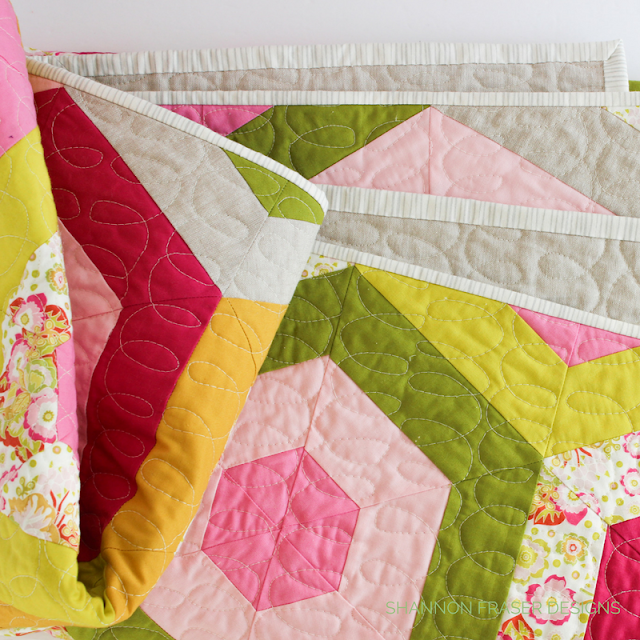 Gorgeous quilt and amazing quilting. Thanks for sharing!!! Clever, right?! I literally was laughing out loud when I read that and it makes me smile every time I think about it! Sometimes, you just need a strong reminder that you can do it!! This is a stunning finish Shannon! I just love all those gorgeous, bright colours! Your FMQ is super nice too - I have yet to try the loops in a row like that. I really like the overall look of it. 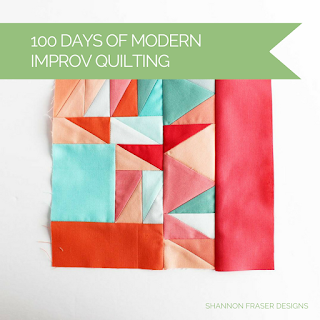 It’s beautiful, Shannon, and way to go jumping in with free motion quilting! It really does use quite a bit of thread, something I still underestimate, haha. 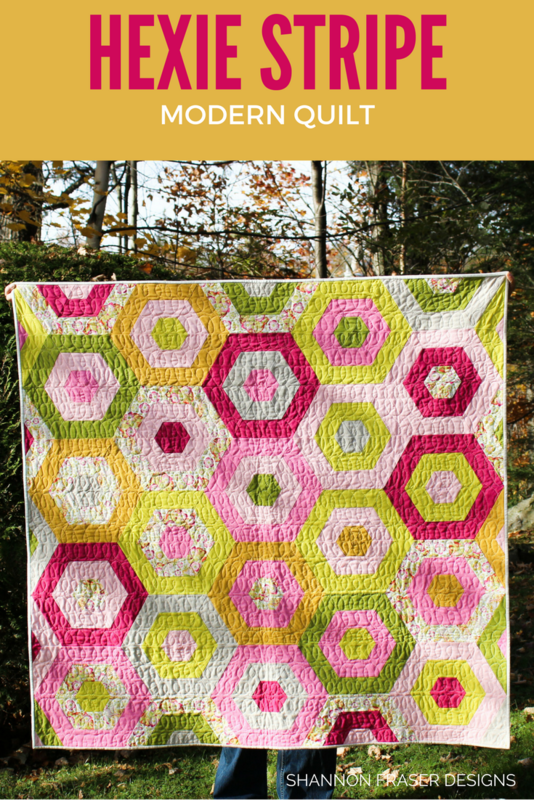 I love that you made the quilt larger than you had planned; the colors just glow! Thank you so much, Yvonne! I was so surprised how much thread I went through, but well worth it for the final results. 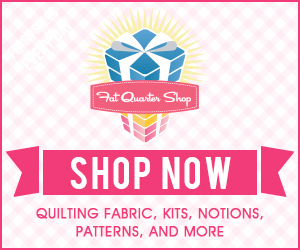 I'm super excited to try new FMQ motifs! It's crazy how much thread you can go through with fmq, lol! Your quilt is gorgeous. Those colours really sing together and the loopy quilting is perfect. You did a great job on that "table runner." 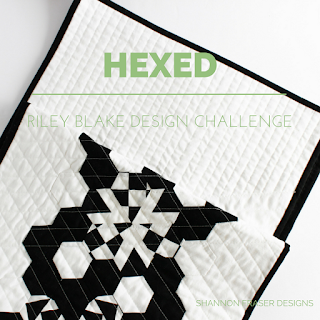 Nice work on the FMQ-ing, too!! If you didn't tell us, I never would have known that it was your 1st attempt. This is really beautiful!! Great job on the fmq, and your points are exquisite! I found you via Rachel at Stitched in Color. I make my labels very similarly, though I use batiste instead of interfacing (I hate the idea of not pressing until I'm ironing it onto my quilt) and I never thought to use a permanent marker, so I will do that in the future - thanks for the tip! I haven't heard of batiste, so I will definitely check it out 😊 And super happy you stopped by for a visit! !